What follows is an edited transcript of recent discussions between His Excellency Abdulla Y. Bishara, Founding Secretary General of the Gulf Cooperation Council (GCC), and Dr. John Duke Anthony, National Council on U.S.-Arab Relations Founding President and CEO as well as Founding Secretary of the U.S.-GCC Corporate Cooperation Committee. H.E. Abdulla Bishara was not only the first leader of the GCC, but is also the longest-serving leader in the organization’s history. He was elected to four consecutive three-year terms from 1981 to 1993. Bishara was previously Ambassador of Kuwait to the United Nations from 1971 to 1981 and, prior to that, Director of the Office of Kuwait’s Ministry of Foreign Affairs. H.E. Bishara and Dr. Anthony’s friendship dates from the GCC’s May 1981 founding in Abu Dhabi. Dr. Anthony was one of the official guests present for the occasion, and since then has been invited to every GCC Annual Ministerial and Heads of State Summit. The two reconnected several times recently, first in Doha, where Bishara was the keynote speaker at the Arab Center for Research and Policy Studies’ Second Annual Gulf Studies Forum. Dr. Anthony also participated in the forum in addition to holding meetings with Qatar University officials, including Dr. Abdullah Baabood, Director of the University’s Gulf Studies Program, on whose Advisory Board Dr. Anthony serves. They met again a few days later in Riyadh, where they were among the invited guests for the GCC’s 36th Annual Heads of State Summit. H.E. Abdulla Y. Bishara, Founding Secretary General of the Gulf Cooperation Council (GCC), and the organization’s longest and highest-ranking official to serve in that position for a record of four elected three-year terms, with National Council on U.S.-Arab Relations Founding President and CEO Dr. John Duke Anthony at the GCC’s 36th Annual Summit, December 10-11, 2015 in Riyadh, Saudi Arabia. 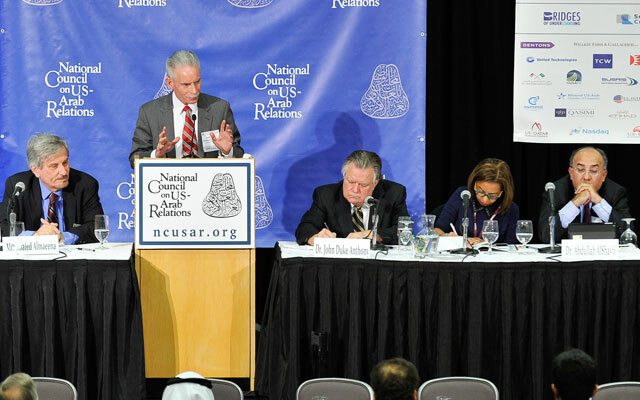 Photo: National Council on U.S.-Arab Relations. The transcript includes discussions between H.E. Bishara and Dr. Anthony regarding the GCC’s founding. An earlier report on this topic centered on how the founders envisioned emulating the European Union in matters regarding economic cooperation and integration. That report was offered in conjunction with analyses and assessments by incumbent GCC Secretary General Dr. Abdul Latif Bin Rashid Al Zayani in a seminar sponsored by the National Council and the Council’s U.S.-GCC Corporate Cooperation Committee. Both reports venture behind the headlines. In places, they contest what are often mistakenly unchallenged views of the circumstances surrounding the establishment of the GCC. This transcript does the same by providing hard-to-come-by information, insights, knowledge, and understanding regarding the geostrategic and geopolitical conditions of the time. Readers will also find material that bears on the GCC countries’ contemporary concerns, namely terrorism, regional security, and, by extension and implication, the ongoing issues and challenges represented by Iran and Iraq. As such, the transcript provides context and perspective on the current array of issues and challenges confronting the GCC’s decision makers as they face an uncertain future. The account is composed in the format of questions from Dr. Anthony and responses from H.E. Bishara. Q: Were you to address Americans and others who were not present when the GCC was founded in Abu Dhabi in May 1981, what would you have them recall as to the situation prevailing then that served to bring the GCC into being? Death and destruction were at our doorstep. We were aghast at the nature and extent of the challenges we faced. Iran and Iraq were at each other’s throats, and each had populations as large or larger than ours combined. A: Regardless of the fact that the GCC would likely have been established at some point, it was Iran’s and Iraq’s resort to armed conflict that provided the immediate geostrategic and geopolitical context and also the pretext for the GCC’s establishment, indeed its necessity. We were under a cloud. Death and destruction were at our doorstep. We were aghast at the nature and extent of the challenges we faced. (Would that the threatening issues in play then were not still in some ways present.) Iran and Iraq were at each other’s throats, and each had populations as large or larger than ours combined. Q: Was it just the enormous demographic asymmetry that was such a cause for concern? A: It was that and the fact that each had armed forces that were larger, better equipped, and more experienced than all six of ours. Given their and our respective capacities at the time, it was also that their swords were drawn and were being used; in contrast, ours, impressive as they were in the eyes of some, were still sheathed. As such, the imbalance was precarious. Q: But as the two were fighting only each other, and neither Iran nor Iraq appeared ready to attack any of the GCC’s founding members, how did this affect the situation? A: One had little choice but to assume the worst. Not to prepare for what sooner or later would likely be coming toward us was hardly an option. [LEFT] H.E. 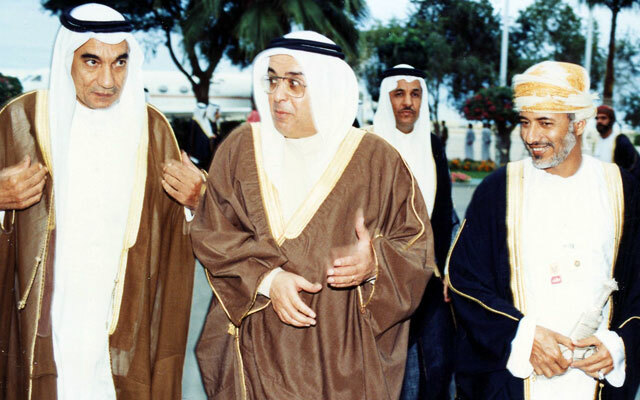 Abdulla Y. Bishara; [MIDDLE] HH Shaikh Mohammed bin Mubarak Al Khalifa, Bahrain’s former Minister of Foreign Affairs (1970 to 2005) and present Deputy Prime Minister; and [RIGHT] H.E. Yusuf bin Alawi bin Abdullah, Oman’s Minister Responsible for Foreign Affairs, at the 10th GCC Summit in Muscat, Oman, in 1989. Photo: Dr. John Duke Anthony. Q: What made this seem so certain? A: Baghdad and Tehran alike were reeling in anger at what we had done. In ways that were similar yet different, each was fuming at what most analysts, in retrospect, seem to have forgotten or overlooked. Both were irate that we had, in their eyes, stolen a march on them. Here were the GCC’s six founders forging a degree of unprecedented unity of purpose among the region’s eight countries. Session on Gulf Cooperation Council: Role in Regional Dynamics with Dr. John Duke Anthony, Ambassador (Ret.) Dr. Richard J. Schmierer, Mr. Khaled Almaeena, Dr. Abdullah AlShayji, and Ms. Elizabeth Wossen from the National Council on U.S.-Arab Relations’ 24th Annual Arab-US Policymakers’ Conference, “U.S.-Arab Relations at a Crossroads: What Paths Forward?,” on October 14, 2015, in Washington, DC. The Gulf Cooperation Council (GCC) and its six member-countries – Bahrain, Kuwait, Oman, Qatar, Saudi Arabia, and the United Arab Emirates – could hardly have been more in the news in recent days. First, as noted in the analysis and assessment that follows, there was the National Council on U.S.-Arab Relations’ meeting with and briefing by His Excellency Dr. Abdul Latif Bin Rashid Al Zayani, Secretary General of the Gulf Cooperation Council, on September 18, 2015. National Council Founding President and CEO Dr. John Duke Anthony, the only American to have been invited to attend each and every GCC Ministerial and Heads of State Summit since the GCC’s establishment in 1981, presided, provided context, background, and perspective, and moderated the discussion and question and answer period. GCC Secretary General Dr. Abdul Latif Bin Rashid Al Zayani addresses a meeting organized by the National Council on U.S.-Arab Relations and its U.S.-GCC Corporate Cooperation Committee on September 18, 2015, in Washington, DC. Seated to the right of the Secretary General is H.E. Shaikh Abdullah bin Mohammed bin Rashid Al Khalifa, Ambassador of Bahrain to the U.S., and seated to the left of the Secretary General is National Council Founding President and CEO Dr. John Duke Anthony. Photo: National Council on U.S.-Arab Relations. Third, was the National Council’s standing-room-only October 6 meeting with and briefing by HRH Navy Captain (Ret.) Prince Sultan bin Khalid Al-Faisal Al Sa’ud in The Gold Room of the Rayburn Building of the U.S. Congress’ House of Representatives. In the ninety-minute meeting, Dr. Anthony provided an introductory overview of Saudi Arabia’s position and role in regional and global affairs and led a spirited discussion session following HRH Prince Sultan’s remarks. HRH Prince Sultan outlined his views, analyses, and assessments of Saudi Arabia’s heightened assertiveness on the national and regional defense fronts. Upon the conclusion of his remarks, the Prince fielded close to thirty questions. HRH Prince Sultan’s address, Dr. Anthony’s remarks, and the Prince’s response to questions will be posted to the Council’s website by the end of the week. Fourth, only two hours after the National Council’s program on Capitol Hill, the U.S. Senate Foreign Relations Committee, chaired by Senator Robert “Bob” Corker from Tennessee, conducted a hearing on“The U.S. Role and Strategy in the Middle East: Yemen and the Countries of the Gulf Cooperation Council.”Accompanied by six of his fellow Senators, he did so in the context of, among other things, President Obama’s summit with the representatives of all six GCC countries this past May at Camp David. Committee members also examined the GCC countries’ leadership in the ten-nation coalition fighting to restore the legitimate government of Yemeni President Hadi. H.E. 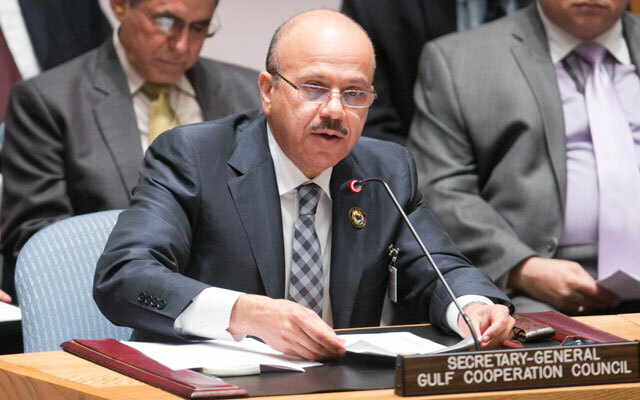 Dr. Abdul Latif Al Zayani, Secretary General of the Gulf Cooperation Council, addresses a meeting of the United Nations Security Council concerning the situation in Yemen in September 2013. Photo: United Nations. In addition, the members asked questions about where the United States and the GCC countries stand with regard not only to the conflict in Yemen. They also voiced their concerns about the situation in Syria and the respective approaches by Washington officialdom, on one hand, and the capitals of the GCC countries, on the other, to the challenges that an assertive and increasingly emboldened Iran poses to the region’s peace, security, and stability. A recurring issue was GCC countries’ perception of a U.S. disengagement from the region, which American officials, with mixed success to date, have been at pains to deny. Coupled to this issue is what many in the GCC believe is an unspoken American intention to increase the position and role of Iran’s involvement in the region. Were such an eventuality to occur, numerous among the GCC’s analysts are of the view that it could come only at the GCC region’s expense. Two outstanding resource specialists, former U.S. Assistant Secretary of Defense Mary Beth Long and former U.S. Ambassador to Yemen Stephen Seche, delivered statements and fielded questions from the Senators for two hours.Their respective testimonies along with a video of the Hearing are available on the Foreign Relations Committee website. All four of these developments serve to underscore the timeliness and relevance of GCC Secretary General Al Zayani’s following analyses and assessments at the National Council’s recent meeting and briefing. 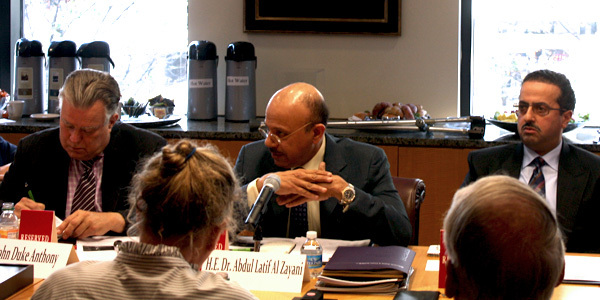 On Friday, September 18, 2015, the National Council on U.S.-Arab Relations and the Council’s U.S.-GCC Corporate Cooperation Committee convened an informal seminar with GCC Secretary General Dr. Abdul Latif Bin Rashid Al Zayani. Present, in addition to GCC ambassadors to the United States, were national security, defense, and other foreign affairs analysts and practitioners as well as scholars and select graduate students from area universities. Dr. Al Zayani’s remarks focused on issues and interests of current and ongoing importance to the GCC and its six member-countries: Bahrain, Kuwait, Oman, Qatar, Saudi Arabia, and the United Arab Emirates. In a private meeting later with National Council President and CEO Dr. John Duke Anthony, the Secretary General agreed that the following summarization of his key points and perspectives could be published in keeping with the Council’s educational mission. Such is the occasion in this instance. The National Council on U.S.-Arab Relations is privileged to publish an address by GCC Secretary General Dr. Abdul Latif Bin Rashid Al Zayani. 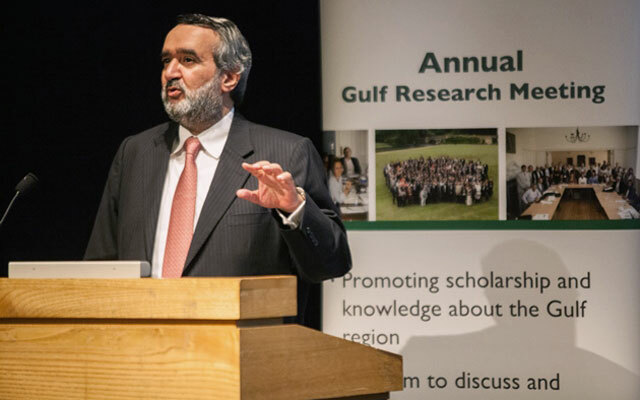 On August 24, 2015, Dr. Al Zayani addressed a capacity audience at Queens’ College, University of Cambridge, convened for the Sixth Annual Gulf Research Meeting (GRM). 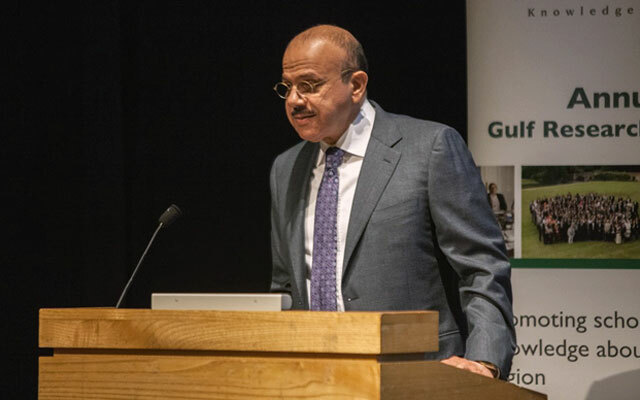 GCC Secretary General Dr. Abdul Latif Bin Rashid Al Zayani addresses the Sixth Annual Gulf Research Meeting in Cambridge, United Kingdom. Photo: Gulf Research Center. Dr. Al Zayani’s remarks covered a broad range of topics. Principal among his focus were the implications for regional peace, security, and stability of the extraordinary trends and indications confronting the GCC in the past year. These included the domestic and international dynamics of violent extremism, Iran, Syria, and Yemen, together with other issues and challenges as well as opportunities. 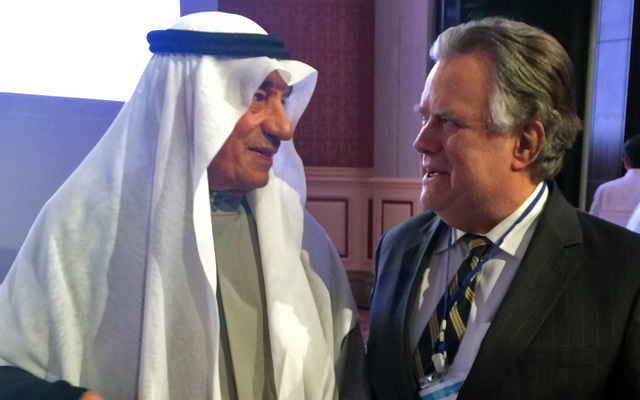 Dr. Al Zayani, a native of Bahrain, is the fifth head of the Riyadh, Saudi Arabia-based GCC Secretariat General. He has held the post since December 2010. He holds a doctorate from the U.S. Naval Postgraduate School in Monterey, California. Of particular significance is that this was the fifth time for Dr. Al Zayani to address this annual meeting. The hundreds (fewer than twenty of whom were Americans) that he briefed and met with represented no ordinary assemblage. They encompassed what, by any standard, is the foremost yearly gathering of Arabian Peninsula and Gulf specialists known to convene anywhere. Included among the international scholars, academics, researchers, analysts, authors, consultants, and other foreign affairs practitioners was a growing number of young researchers from the GCC region, Yemen, and Iraq, who represent the emerging generation of those destined to lead and manage the region’s future. Each of the participants came together this year, as on every previous occasion, for three full days of meetings, discussions, and debates. In so doing, beyond examining the present and coming state of affairs with regard to a virtual smorgasbord of topics, they also proposed and recommended solutions to some of the most vexing geopolitical, cultural, socio-economic, and foreign relations issues of the contemporary era. What entices all who engage in the GRM’s exceptionally well-selected and choreographed seminars is their abiding interests and involvement in a variety of issues anchored in Arabia and the Gulf. This is the exact same focus of the National Council on U.S.-Arab Relations’ recently concluded academic seminar for its Annual Washington, DC University Student Summer Internship Program in association with 22 sister organizations and the Elliott School of International Affairs at The George Washington University. 25 interns, out of an applicant pool of 125 candidates, participated in this summer’s program. None of the GRM’s presenters and other participants needed reminding of the extraordinary impact that this region has had and continues to have upon all of humankind. Nor, despite this, are they unaware of how the region’s peoples, cultures, economies, governmental structures, foreign relations, and systems of political dynamics constitute for millions worldwide the most often misunderstood and unfairly maligned of any on earth. Enter the Gulf Research Center, the GRM’s host convener. The GRC, founded by Saudi Arabian Dr. Abdulaziz Sager, organizes and administers these Annual Gulf Research Meetings in association with Cambridge University. (The National Council entered into a Cooperative Agreement with the GRC this past year). No stranger to Washington, DC, Dr. Sager has addressed several National Council Conferences and Capitol Hill Seminars for Members of Congress, Congressional staff, media representatives, members of the diplomatic corps, and the broader U.S., Arab, and other foreign policymaking communities. Dr. Abdulaziz Sager, Chairman of the Gulf Research Center, welcomes participants to the Sixth Annual Gulf Research Meeting (GRM). Since the first GRM in 2010, over 1,200 papers have been presented in 86 workshops and scholars from 86 countries have participated in the event. Photo: Gulf Research Center. The GRC has catapulted into one of the foremost of its kind in a very short period. Based in Jeddah, Saudi Arabia, with regional offices in Geneva, Switzerland, and Cambridge, United Kingdom, the GRC, in addition to its association with the National Council, has partnered with dozens of research and academic institutions in virtually every corner of the globe. By special arrangement with Dr. Al Zayani, the National Council is privileged to share this edited version of his remarks to this year’s GRM. So where are we today? Da’ish (Arabic for what many loosely refer to as the “Islamic State”) continues as the single greatest challenge for us all. Syria awaits, amid unabated devastation and bloodshed, a solution. The stubborn violence in Libya is ongoing. The so-called Middle East Peace Process is all but dead. Uncertainties over Iran’s destabilizing ambitions linger. Yemen is in the throes of a serious conflict. Our region continues to be the single worst breeding ground for extremism and harboring terrorism. At the same time, it has become the greatest importer of foreign fighters. Add to this the steep drop in oil prices, which has done nothing to enhance stability. Not a happy story, is it? And yet in a strange sort of way, within all these dynamics, “the unthinkable has been thought!” There has been a clarification on certain issues. For instance, the initial stages of a final agreement on the Iran nuclear program, which is probably the best possible political solution for this thorny issue, has been signed. The unlikely alliances countering Da’ish are bonding more closely. The full impact of extremism is forcing the global community into a more cohesive counter stance. Lastly, the situation in Yemen is worse in terms of violence than it was last summer, but at least something is being done about it. It is these topics – the macro implications of the nuclear agreement, Da’ish and extremism, and the micro implications of the situation in Yemen – that we will consider. On May 15, 2015, Dr. John Duke Anthony, Founding President & CEO of the National Council on U.S.-Arab Relations, appeared on Inside Story on Al Jazeera English. The program explored the recently concluded U.S.-GCC Summit in Washington and Camp David, and U.S. pledges to defend its Gulf allies. After a Nuclear Agreement: Whither Arab-Iranian and U.S.-GCC Relations? 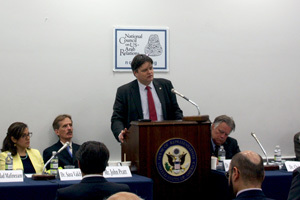 On May 12, 2015, the National Council on U.S.-Arab Relations, the West Asia Council, and the U.S.-GCC Corporate Cooperation Committee hosted a public affairs briefing titled “After a Nuclear Agreement: Whither Arab-Iranian and U.S.-GCC Relations?” in the Rayburn House Office Building in Washington, DC. Featured specialists included: Dr. John Duke Anthony, Founding President and CEO, National Council on U.S.-Arab Relations; Dr. Christian Koch, Director, Gulf Research Center Foundation (Geneva, Switzerland); Dr. Sara Vakhshouri, President, SVB Energy International, and author, The Marketing and Sale of Iranian Export Crude Oil Since the Islamic Revolution; Dr. Thomas Mattair, Executive Director, Middle East Policy Council, and author, The Three Occupied UAE Islands: The Tunbs and Abu Musa and Global Security Watch – Iran: A Reference Handbook; Dr. Alidad Mafinezam, President, West Asia Council, and author, Iran and Its Place Among Nations; and Dr. Imad Harb, Distinguished International Affairs Fellow, National Council on U.S.-Arab Relations. Mr. John Pratt, Member, Board of Directors, and Distinguished International Affairs Fellow, National Council on U.S.-Arab Relations, served as moderator. A video recording and a podcast of the program are available below. The podcast can also be found in iTunes along with recordings of other National Council programs: http://bit.ly/itunes-ncusar. The GCC-U.S. Summit: An Opportunity for Strategic Reassurance? An unprecedented and extraordinary event is about to occur: a heads of state summit. These, by any standard, can be and often are extraordinary events. That’s what this one is. It is so because it gathers in the capital of the United States President Barack Obama with the representatives of the six Gulf Cooperation Council countries: Bahrain, Kuwait, Oman, Qatar, Saudi Arabia, and the United Arab Emirates. The two-day summit is set for May 13-14, 2015. GCC leaders are scheduled to meet with the president in Washington on day one and on day two gather with him in the more capacious and secluded confines of Camp David. The latter venue is a longtime private presidential meeting place in the Maryland foothills, which is conducive to wide-ranging and deeply probing discussions on matters of common, timely, and varying degrees of urgent interest to the president, his advisers, his guests, and their advisers. The focus of this essay is the issues, challenges, and opportunities that will focus the principals’ attention while there. That the summit is occurring at this time is no mere coincidence. In terms of the GCC-U.S. relationship, it brings to the forefront the chief representative of the world’s most militarily, economically, and technologically advanced nation. Joining him will be the leaders of six neighboring Arab Gulf countries from what is arguably the world’s most strategically vital region that are little known and even less well understood by the American people as a whole. What needs to be better comprehended by the American public regarding these countries are the roots and nature of their multifaceted strategic importance not just to their peoples and immediate region, but also the United States and the world in general. 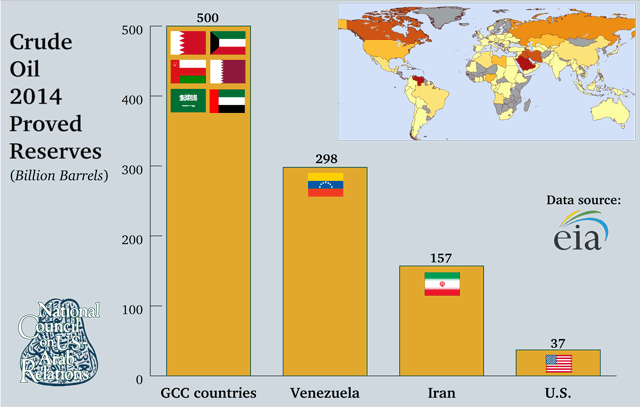 To begin with, the six GCC countries possess thirty per cent of the planet’s proven reserves of oil, the vital strategic commodity that drives the world’s economies. Collectively, they are also the holders of the developing world’s largest reservoir of financial assets, as measured in the trillions of dollars. In addition, the GCC countries have no rivals in their combined positive impact on the American aerospace and defense industries. In the past half-decade, their purchases of U.S.-manufactured defense and security structures, systems, technology, weaponry, ammunition, training, maintenance, and operational assistance have massively impacted and continue to impact the American economy. The dynamism and mutuality of benefits in the U.S.-GCC relationship are envied by virtually every country that wishes it could accomplish anything remotely similar. The purchases of American export goods and services by these countries have provided jobs essential to the material wellbeing of millions of Americans. They have extended production lines of products that would otherwise no longer be available. As a consequence, they have lowered the cost per unit of many American manufactured goods. In so doing, they have thereby enhanced the competitiveness of this component of the American economy to a degree envied by virtually every government or corporation in other countries that would wish they could accomplish anything remotely similar. 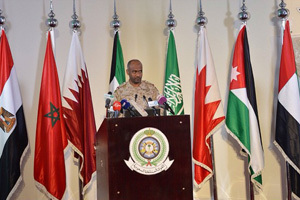 Operation Decisive Storm Coalition Forces’ spokesman Saudi Brigadier General Ahmed Asiri provides a briefing on developments in the campaign. Photo: Saudi Press Agency. While the Saudi-led Operation Decisive Storm against the Yemeni Houthis and their allies continues and its long-term results are so far unknown, it is not pre-mature to project that a new Arab political order is being consolidated. Its elements include a firm and sustainable commitment to fight extremism and sectarianism, bring order and stability to the heart of the Arab world – namely, Syria and Iraq – and design, chart, and lead an independent course for the protection of pan-Arab national interests. Such an order has a leader in the collective energies and capabilities of the countries of the Gulf Cooperation Council, with Saudi Arabia as a first among equals, and essential assistance from such countries as Egypt, Jordan, and Morocco. Indeed, to assure its collective interests, arrive at a hoped-for peaceful stability, and sustain much needed political, economic, and social development, the Arab world must coalesce around a strong political order that can utilize its capacities and permissible international conditions to achieve what it needs and deserves. Importantly, the consolidated new Arab political order appears to emphasize essential principles that require astute judgment, committed resources, and continuous vigilance. The status quo states of the new Arab order are cognizant of the threats represented by the plethora of extremist groups operating at the heart of the Arab world. In Yemen, al-Qaeda in the Arabian Peninsula has staked a claim in Hadramawt Province abutting the Saudi Arabian border after it lost its bases in Shabwa and Abyan to the west. In Iraq and Syria, the Islamic State group has erased the borders between the two countries in a mission to re-establish an imagined and borderless Islamic Caliphate while al-Qaeda-affiliated al-Nusra Front controls strategic areas of Syria. Both organizations are serious threats to Lebanon and its pluralist political society. In Libya, the Islamic State group, al-Qaeda affiliated Ansar ash-Shari’a, and a sundry of militias have settled, and promise to both keep the country unstable and use it as a base to spread chaos and mayhem elsewhere. In Tunisia and Egypt, jihadist extremists are waging a war of attrition against state security institutions. The actors of the consolidating Arab political order must know full well that they alone can address this threat in a fashion that combines a sense of shared responsibility for common interests and an attempt at forging an independent course that serves such interests.